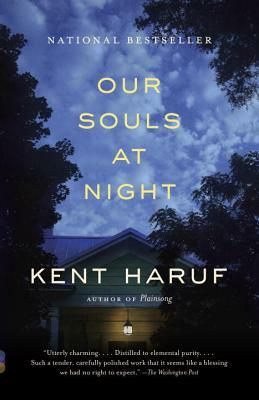 "Our Souls at Night" is a spare book , one sitting. Great appeal and relevance for over sixty readers. The surprising opening offer hooks the reader right away. Haruf cleverly references some of his other books. The author skillfully navigates emotional landscape. The characters' reflections provide enough development to make the reader care about their well being in the present.